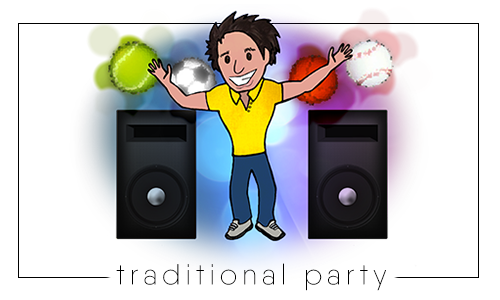 This award winning package can fit in with your party plans wherever the venue. This classic 2 hour package includes sporting activities, team competitions, parachute games, comedy, music and disco. We also try to assist you serving food and present your special ones birthday cake. We can also tailor this package to a theme of your choice. We do this through our games and routines. Sadly however we do not provide any mascots or costumes. We break for the ‘birthday feast’ after the first hour of entertainment. We ask that the cake is presented just before food is served (usually carried out after 1st hour). We may have to charge a travel fee, should the venue be out-with our normal working area. Please click HERE for further explanation of the party and for general FAQs. Over the years we have found that pre-schoolers don’t quite have the attention span for a full 2 hour party. This is why we have structured a shorter package that still includes all the elements from our regular party. 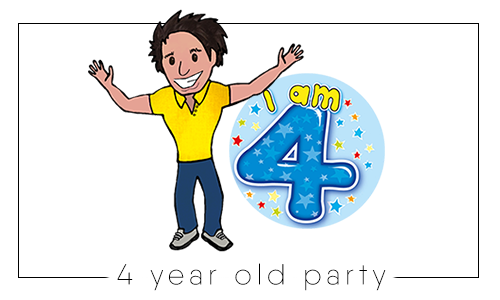 The 4-year-old party is 90 minutes in total. We still break to present the cake and sit the kids down for party food after the first 45 mins. Allowing the kids that time to have a bite to eat follows with another burst of entertainment before concluding the party. We would however advise that you invite guests 15 minutes prior to our starting time. We break for the ‘birthday feast’ after the first 45 minutes of entertainment.